The Avengers are pressed into action when Tony Stark’s experimentations with artificial intelligence unleashes Ultron – a malevolent programme intended for peace keeping that decides to become the master of its own fate…and humanity’s. With the weight of near impossible odds stacked against him, writer/director Joss Whedon’s follow up to 2012’s mega hit (equally of critical and commercial proportions) – and dare us forget, third highest grossing film of all time – Avengers Assemble is finally unleashed upon entertainment and thrill hungry film goers. Avengers: Age of Ultron opens by lunging the audience into a Bond-esque pre-titles mission as the Avengers, lead by Robert Downey Jr’s Iron Man and Chris Evans’s Captain America, raid a secret Hydra base to recover Loki’s sceptre (see Avengers Assemble). It’s a gloriously explosive and energetic opening that facilitates our reintroduction to ‘Earth’s Mightiest Heroes’, an introduction to new characters (following their brief appearance in the post-credits sequence of Captain America: The Winter Soldier) meta-humans Pietro and Wanda Maximoff and the set-up for the world-shattering events to follow. Whilst the speedster of the Maximoff twins, Pietro (Taylor-Johnson) becomes largely a secondary character it is Wanda (Olsen) who figures more substantially in the narrative as her psych abilities are used to reach into the darkest corners of the minds of our beloved Avengers. Right from the outset it’s clear that this is a much darker affair and the startling imaginations of Tony Stark’s fears set the tone for a more dramatically and thematically daring narrative than the previous Avengers outing. Marvel Studios proved with Captain America: The Winter Soldier that such a creative direction is the way to go (whilst still indulging audiences in a spot of lighter entertainment in the form of the enjoyably fun Guardians of the Galaxy) and ensures that although Age of Ultron delivers much of what we all loved about Avengers Assemble – great characters, exhilarating action, of which there are numerous exciting set-pieces including a city smashing face-off between Iron Man and the Hulk that’s sure to delight fans and of course, humour – there is a seriousness and maturity that elevates the film above the realm of mere blockbuster fodder. With an exciting, dramatic, intelligent and witty script Whedon crafts a glossy, quality comic book adventure that amongst all of the grand spectacle has a great deal of character depth. Tony Stark continues to battle his demons as does Bruce Banner, increasingly ill at ease with his angry and destructive alter-ego who’s only saving grace is a blossoming tenderness with Natasha Romanoff/Black Widow, Steve Rogers is still very much a man out of time and Thor…well, is Thor. Jeremy Renner’s Clint Barton (a.k.a. Hawkeye) is also better served this time around as we glimpse into a personal life beyond world saving escapades with the Avengers. Downey Jr and Evans are once again on top form, returning with the assured confidence afforded them by star popularity and billions of dollars in box office takings. They receive a more than worthy protagonist with James Spader triumphing in the role of the delightfully maniacal, egotistic and surprisingly funny Ultron, thanks to a combination of operatic dialogue and intricate motion capture performance. Whilst it’s hard not to miss Tom Hiddleston’s Loki, Spader provides a gravitic presence of black hole proportions. It also has to be said that Mark Ruffalo is once again a highlight as the troubled Bruce Banner and given the lack of any solo Hulk films in the near future is quite rightly given significant focus in Age of Ultron. Central players aside, Age of Ultron features a glut of fan pleasing cameos from familiar faces including Don Cheadle as James Rhodes/War Machine, Anthony Mackie as Sam Wilson/Falcon, Cobie Smulders as Maria Hill and Samuel L. Jackson as Nick Fury (not forgetting of course the customary appearance from the ever legendary Stan Lee). Paul Bettany adds himself to the Avengers roster as he ‘evolves’ from Stark’s trusty electronic assistant JARVIS to the living, breathing bio-mechanical super powered entity known as ‘Vision’, superbly realised using a mixture of physical and computer generated elements . With so many characters vying for attention it’s surprising that Age of Ultron doesn’t collapse under its own weight yet it holds together rather well and everyone generally gets their moment to shine – however large or small that turns out to be. If there’s any criticism to be cited then it’s that there’s a great deal of set-up for forthcoming Marvel projects, with moments taken to lay the ground work for Captain America: Civil War, Thor: Ragnarok, Black Panther and Infinity War Part I and II. Sure, it’s all pleasing and to an extent necessary, yet it does threaten to verge on advertisement, although it’s probably an element that will be more welcome on subsequent viewings – perhaps enriched when those future Marvel outings are released. The film’s music score is also a little underwhelming and lacking, a shame since composers Brian Tyler and Danny Elfman have both previously delivered some wonderful and strong comic book film scores. On the whole, Whedon delivers a creatively successful film that stands at least on equal footing with Avengers Assemble and sets the Marvel Cinematic Universe firmly on course for its next phase. The bottom line: Avengers: Age of Ultron is a hell of a good time that focuses tightly on its rich set of characters whilst still providing audiences with colossal action and all around blockbuster entertainment. Avengers: Age of Ultron is in cinemas across the UK now and opens in U.S. theatres on 1st May. 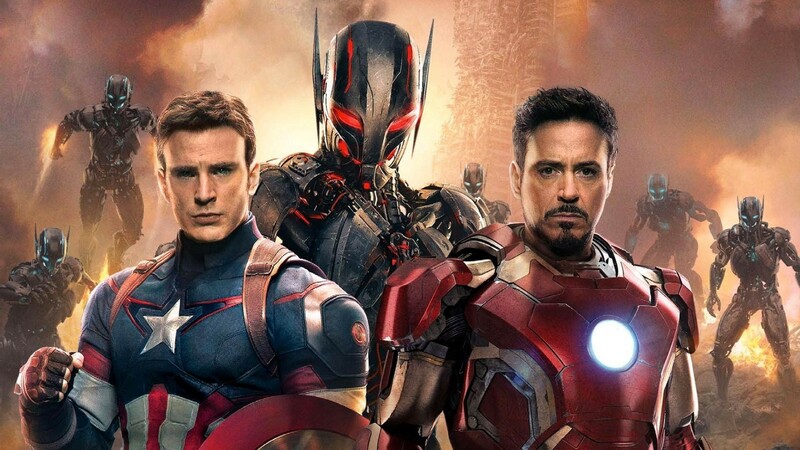 Captain America (Chris Evans) and Iron Man (Robert Downey Jr.) return to lead the Avengers against new threat ‘Ultron’ (James Spader) in Marvel’s ‘Avengers: Age of Ultron’. Protected by the mysterious ‘Batman’, the innocent of the corrupt and crime-ridden Gotham City soon find themselves facing a new and deadly threat…a homicidal criminal known only as ‘the Joker’! Amongst the many screen iterations of Bob Kane’s comic book creation, for many (myself included) Tim Burton’s Batman is perhaps the most perfect. The highest grossing box office success (and merchandising behemoth) of 1989, Batman succeeds on numerous levels. Whilst taking the iconic character and his world back to the roots of Bob Kane’s vision and mirroring the darker and more adult comic book interpretations of Alan Moore’s The Killing Joke and Frank Miller’s The Dark Knight Returns, Tim Burton’s gothic fantasy also retains an element of the camp wit and charm of the hit 1960s Batman television series starring Adam West. Michael Keaton makes for a perfect Bruce Wayne. Effectively dark and brooding with just the right hint of angst, Keaton proved the naysayers of the time wrong and allayed the fears of millions of Bat-maniacs (here’s hoping the same will be true of Ben Affleck in the forthcoming Batman v Superman: Dawn of Justice). Beyond a flashback to the tragic murder of Wayne’s parents, the origin of Batman is not explored in too much detail yet provides the crux of Bruce Wayne’s story and the subtleties of Keaton’s performance are a key element. Synonymous with the film’s tone, Jack Nicholson (who receives top-billing above Keaton) infuses the role of Jack Napier/Joker with a multi-faceted performance. As gangster Napier, he exudes a steely calm but once reborn as the Joker we are treated to an electrifying and manic portrayal that melds the psychotic elements of Nicholson’s iconic turn in The Shining with a homicidal twist on the camp clowning of Cesar Romero’s portrayal of ‘the Clown Prince of Crime’ in the Adam West TV series. The cast is rounded out by a list of noteworthy names including Kim Basinger, who brings a touch of sparkle and elegance to proceedings as love interest Vicki Vale, Michael Gough as Bruce Wayne’s faithful butler, Alfred, Pat Hingle as police commissioner Gordon and Jack Palance as crime boss Carl Grissom. Beyond the performances of the principal stars, Anton Furst’s Academy Award Winning production design brings the decaying, crime infested streets of Gotham City breathlessly to life (all the more impressive considering it all comprises of sets constructed at Pinewood Studios) and the exhilarating action is elevated by neat stunt work, scintillating pyrotechnics and exemplary special effects and miniatures by the legendary Derek Meddings. The costume design is also inspired, from the jet black armour of the Dark Knight himself to Vicki Vale’s elegant clothing and the pin stripe suits, hats and trench coats – all lending themselves to the otherworldly ‘pulp’ feel of Batman. It would also be remiss to not mention Batman’s “wonderful toys” the highlight of which is the sleek and formidable Batmobile, complete with machine guns, armour shields and that iconic flame exhaust! Equally important to the piece are the dynamic themes of Danny Elfman’s exciting and atmospheric score, complemented by specially produced songs written and performed by Prince. Tim Burton’s Batman transports the viewer into the panels of the comic book world, brought to life by incredible sets and outstanding cast performances – a true classic of the genre. It presents a dark and moody interpretation of Bob Kane’s creation that’s still fun and retains an element of comic book camp without the silliness of later sequels. It features one of Jack Nicholson’s greatest and most intense performances, providing the definitive screen Joker. It boasts impressive production design, bringing the ‘character’ of Gotham City to life. Batman creator Bob Kane was originally due to cameo in the film but fell ill, leading to the proposed scene being scrapped. Batman Returns : although veering a little too far into the realm of gothic fantasy, Tim Burton’s sequel to Batman is still an impressively designed and action-packed affair with a confident return from Michael Keaton and memorable performances from Danny DeVito (the Penguin) and Michelle Pfeiffer (Catwoman). 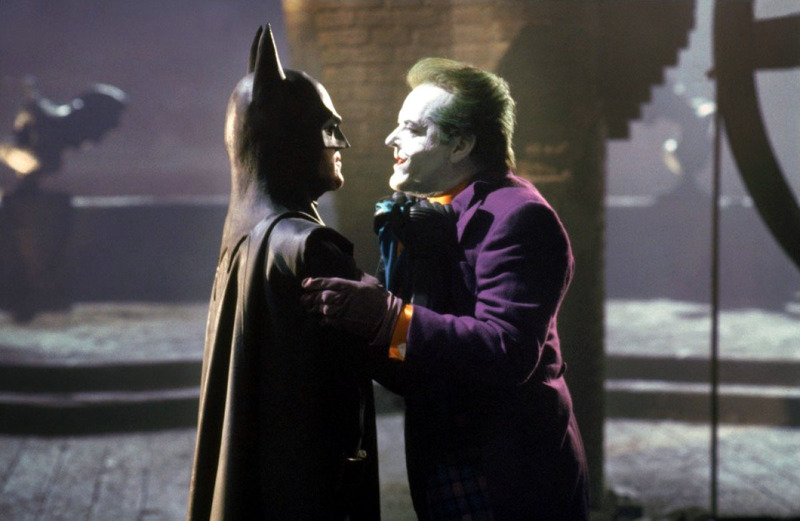 Batman (Michael Keaton) and the Joker (Jack Nicholson) face off in Tim Burton’s seminal big sceeen adaptation of the DC Comics character. Yesterday saw the long awaited worldwide release of the Netflix Daredevil series and having viewed the first two episodes, titled “Into the Ring” and “Cut Man” – both written by series creator and executive producer Drew Goddard (who exited as showrunner to pursue Sony’s now defunct Sinister Six feature film) – I can safely report that, so far at least, it’s yet another hit for Marvel. Being a huge fan of the horned defender of Hell’s Kitchen there is a level of bias (there’s even a place for the maligned Ben Affleck film from 2003 in my books) yet beyond the series perfectly capturing the essence of the character and drawing heavily from the very best of the source material, viewers will find that Daredevil is well scripted, well cast and beautifully realised. Drawing heavily on iconic and fan favourite comic book runs by writers Frank Miller, Brian Michael Bendis and Ed Brubaker (working with legendary artists Klaus Janson, David Mazzucchelli, Alex Maleev and Michael Lark), Daredevil is exactly as it should be – dark, gritty and brutal yet not without heart and a smattering of humour (reminiscent of Mark Waid’s current tenure). Boardwalk Empire’s Charlie Cox looks, sounds and feels the part as blind attorney Matt Murdock – a tortured soul whose tragic back story is presented through a series of flashbacks and is ably supported by law partner Foggy Nelson (Elden Henson) and secretary Karen Page (Deborah Ann Woll), who provides ‘Murdock and Nelson’ with their first case. “Cut Man” also introduces us to another citizen of Hell’s Kitchen – Rosario Dawson as Claire Temple, the woman who will patch and dress the wounds Murdock sustains in his fight against the criminal underworld. Murdock’s night time pursuits (beautifully shot by cinematographer Matthew J. Lloyd) as the vigilante who will become known as ‘Daredevil’ fulfil the brutal element of the series. Not being hindered by the constraints of television censorship, Daredevil is not family entertainment and handles the bone-cracking violence (and general adult themes) appropriately. It’s certainly not gratuitous, but, appropriate. I’m very much looking forward to the full reveal of Vincent D’Onofrio as Wilson Fisk (aka ‘Kingpin’), who is teased during the premiere episode and the further development of the Murdock/Nelson/Page ensemble and the evolution of Murdock’s Daredevil persona – especially the costume that Murdock teases is “a work in progress”. 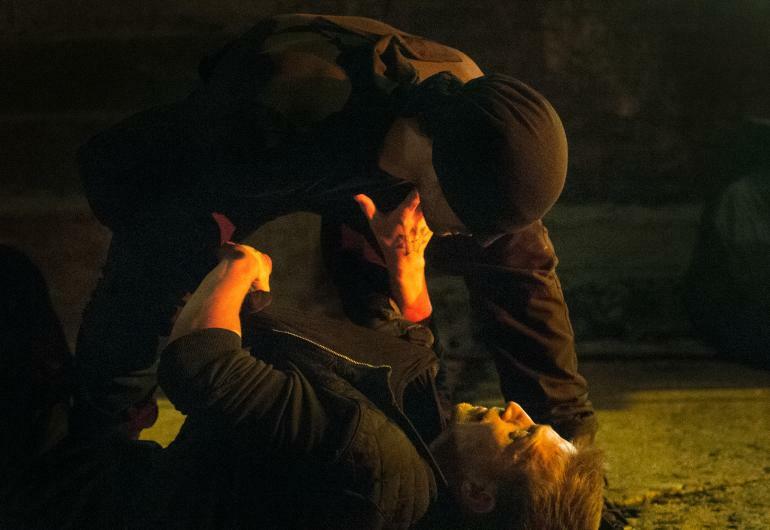 Daredevil is the first of five Marvel/Netflix Original Series with A.K.A. Jessica Jones, Luke Cage and Iron Fist due to follow, culminating in a crossover for Marvel’s street-level heroes in a Defenders limited series. If the quality of Daredevil is anything to go by then these are exciting times to be a Marvel fan and indeed, a Netflix subscriber. All thirteen episodes of Daredevil season one are available to stream now worldwide exclusively on Netflix. Charlie Cox is perfectly cast as Marvel Comics’ defender of Hell’s Kitchen in the gritty and brutal Netflix Original Series ‘Daredevil’.